People and Culture are key to sustaining successful organisations. We were invited to review the user experience for stakeholders of the Human Resources Directorate at Queens University Belfast. The challenge was to simplify and improve journeys throughout the site and ultimately enhance the experience and value of interacting with the Directorate. The site as it stood contained all relevant material, however there wasn’t a straightforward hierarchy in place to allow users the access the information they need as quickly and as painlessly as possible. It was decided to base navigation on three main user personas (Managers, Employees and Prospective Employees) which could form the basis of a more streamlined navigation system. Placing these 3 options front and centre would allow the user to easily self-identify and instantly focus on the areas of the site that should interest them. Organising information so that it is as few clicks (or taps) away as possible should be the main focus. Unnecessary splash screens or other standalone pages that exist for visual effect and carry out no other function should be considered redundant. After all, the user is not here to be entertained, they want to grab the information they need and get on with their day. Our first step was to collate all existing pages and recategorise under the new proposed information architecture. Users in university management positions would be interested in many resources that other employees also would, with the addition of various management toolkits to help with their duties. Users visiting the site with an interest in joining the organisation would have a special interest in areas such as the recruitment process, diversity & inclusion/equality and how their career could progress. A simplified process for users to find and contact who they need to. A mega menu navigation style was implemented to ensure each area of the site was at the end of as short a journey as possible, as well as all frequented/important areas given navigational precedence. Each user type was presented with a specific landing page with pertinent resource materials arranged to benefit their specific needs. In the example below we see prospective employees presented with job opportunities, information on what life is like working at Queen’s University, staff support systems and testimonials from current employees. 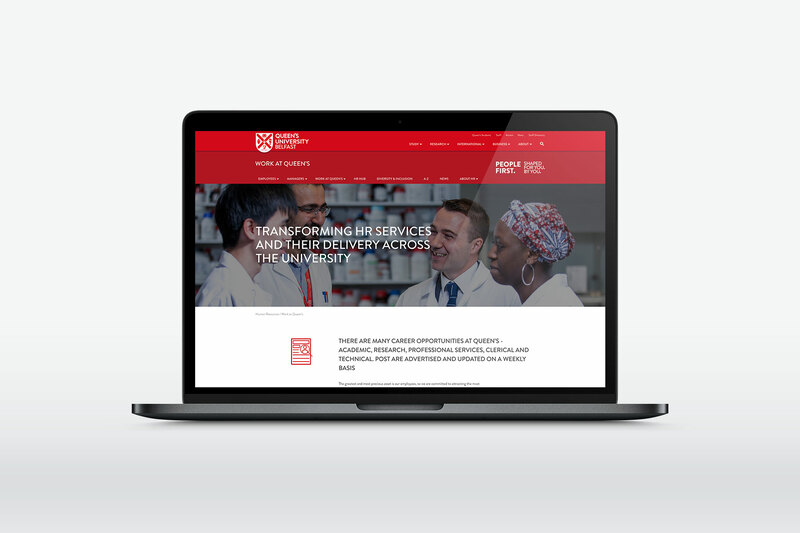 All in all the project was a fantastic opportunity to work with a prestigious institution and help improve upon an already existing digital product at a UX level. Want to get connected? Let's chat.